This year put down the carving knife and pick up a paintbrush to create spooky-cool and stylish pumpkins, they’ll make a gourds-eous autumnal display and are the perfect activity for younger children too. If the thought of going alternative with your jack-o’-lantern sends a shiver down your spine, don’t worry S4K has it covered with family-friendly inspiration for some chilling works of art. 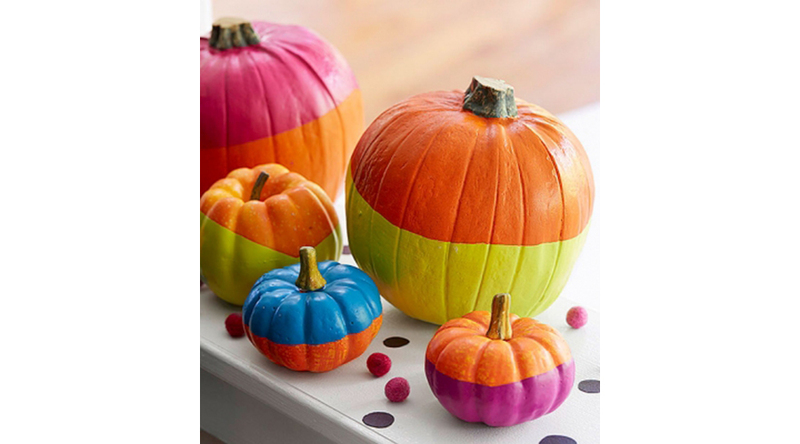 These pretty dip-dyed pumpkins are perfect for a modern display. Use bright hues and get as creative as you dare! Poke four skewers through a shoebox to create a place to dry your pumpkin. Pour paint into a bucket, dip the pumpkin in either straight down or at an angle and let excess drip off. Then rest the pumpkin on the skewers to drip dry. 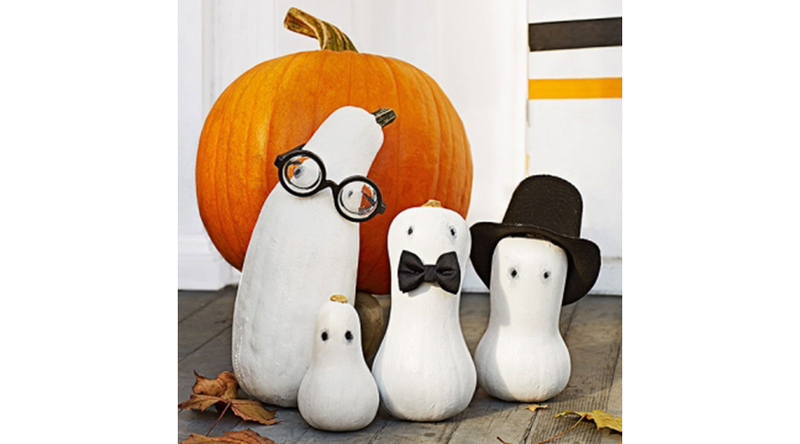 Squash the pumpkin competition and welcome trick or treaters with these hauntingly creative ghost greeters. Paint your squash white with heavy-body acrylic paint, let dry, re-coat and let dry again, then add black dots for eyes. Use pet or dolls accessories such as glasses, a bow tie, and a hat to add personality. Take your Halloween decorating to a whole new level by using adornments found in nature – a great excuse for a scavenger hunt too! 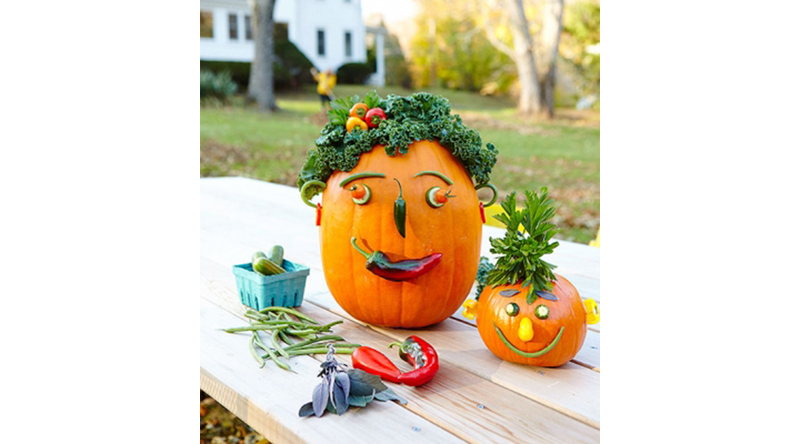 Create this bountiful bunch by securing surplus garden produce, fruits, vegetables or autumn treasures such as fallen leaves and acorns to your pumpkin using a few toothpicks. If the pumpkin’s rind is too tough to pierce, drill holes for the toothpicks with a metal skewer. 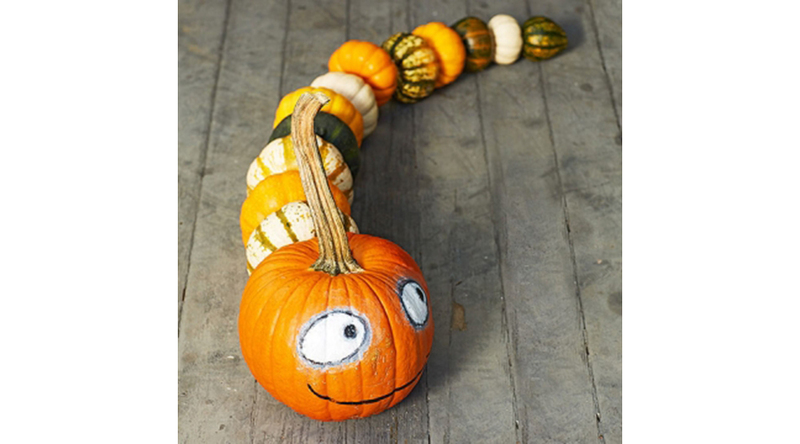 A much more friendly creepy crawly than we’re accustomed to at this time of year, this crazy caterpillar is a no-carve masterpiece. Select a variety of mini pumpkins in different colours and break off the stems. Use toothpicks to connect them and pull out the paintbrush to create eyes and a sneaky smile.